Raccoons are found all over the Tampa Bay area in bigger and bigger numbers. Where do they come from? As they discover the urban areas, their populations grow when food is more readily and easily available. Because of that it is becoming more common to encounter a raccoon near or inside your home. In urban and other areas where tree dens are lacking, raccoons choose a wide variety of “cavities”. A raccoon in your attic in Bradenton can cause major damage. They will nest and bring in the food they have scavenged which will collect and rot. They will also defecate and urinate. The greatest problem with raccoons is disease. Raccoons are known to carry a wide variety of diseases. Most of these are harmless to the raccoon and to people, but a few, such as distemper and rabies, can kill raccoons when their populations get too dense. These diseases also can infect pets that are not vaccinated. The risk of rabies is small (less than 1 out of 200 raccoons in the wild have been exposed to rabies), but the risk should never be taken lightly. Raccoons are wild animals and should never be treated as pets. Your attic or crawl space is bound to get dusty over the years, especially when the only time you’re up there is to get the holiday wrapping paper and ornaments. Next time you poke your head in the attic look around with a flashlight. Look for signs of activity. There may not be a raccoon staring back at you but do you see evidence of there visitations? The pictures here show sure signs of a visitor. 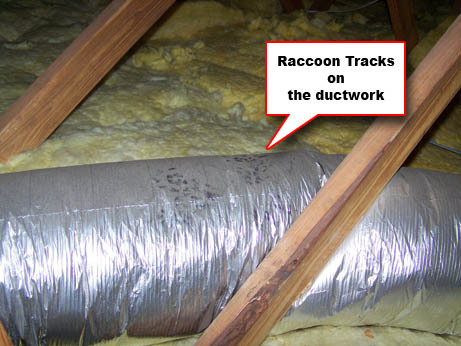 Look closely at the raccoon foot prints in the dust on top of the duct work in this attic. If it looks familiar, give us a call at 866-263-WILD. Nuisance Wildlife Removal will have one of our highly trained technicians come out and assess the signs, look for an entry point, and suggest a solution. The initial evaluation is FREE. Don’t wait until they come inside your home. Call us today at 407-859-9453 (Orlando area), 941-729-2103 (Tampa Bay), or you can always get us at 866-263-WILD.